Highland Lakes has several great ways for active adults to stay active and fit. Just south of The Villages is the charming city of Leesburg, Florida. This central part of the sunshine state is unique in that it provides all the benefits you expect from Florida, like gorgeous weather and dozens of golf courses, but you also get a few surprises that might make you forget you’re in Florida. For example, there’s some elevation. Rolling hillsides and acres of maple trees replace the flat, sandy terrain and rows of palm trees that you see on the coasts. Leesburg has plenty of fishing, horseback riding, antique shopping, and hiking. It also has several great communities that will help active adults stay active. Plenty of opportunities for activity can be found at Legacy of Leesburg, a 55+ community of single-family homes less than an hour from Orlando. In addition to the fitness center, there’s a separate aerobics studio space, which is where residents can find Pilates and other exercise classes. There’s a group that walks to lose weight, and a Weight Watchers club. Water aerobics classes are held in the pool, and there’s also a softball field, tennis courts, pickleball, and bocce ball courts for residents looking for unique and fun ways to stay fit. Clock Tower Hall is the center of activity at Legacy of Leesburg. There are dozens of clubs, social groups, and outings are often planned into town and around Central Florida. Buyers can look for new or resale homes in more than five models and dozens of floor plans. The Palatlakaha River is not far from this community, providing great opportunities to stay active with fishing, hiking, and boating. Active adults looking for both indoor and outdoor exercise should consider Highland Lakes. The grounds provide three nature trails along wetlands and lakes, allowing residents to get their steps in while looking for birds, plants, and wildlife. If you’re unsure about what fitness path is best for you, consult with the activities director who can offer some advice and a schedule of exercise classes taking place at Highland Lakes. This 55+ community offers aerobics, basketball, bowling, yoga, and softball. Amenities for active-minded adults include a pool, shuffleboard, indoor and outdoor tennis courts, an indoor walking track, and horseshoe pits. There is a large exercise room and indoor pickleball. At Highland Lakes, there are 938 single-family and attached homes built by Pringle Development. Buyers can choose from homes and villas that are between 1,120 and 1,852 square feet. With RV and boat storage, this community makes it easy to settle into the local landscape while staying active and healthy. Golf and an activity center provide residents with plenty of opportunities to stay active at Pennbrooke Fairways. 27 holes of golf are available on three different courses. This 55+ community has a fitness center, a large dance floor, a heated outdoor pool with a volleyball net, basketball courts, a softball field, and tennis courts. There are also pickleball courts, shuffleboard courts, and a number of trails for walking and biking around the community. Residents join aerobics and yoga classes, take ballroom dancing lessons, and enjoy billiards and golf groups. Pennbrooke Fairways has 1,200 single-family and manufactured homes. With cottages, duplexes, and a variety of other properties available, buyers can find the resale home of their dreams in any budget. The community is less than 15 minutes from shopping, dining, as well as art museums and historical sites in Leesburg and the surrounding towns. One of the largest and most popular 55+ communities in this part of Florida is Plantation at Leesburg. It’s easy to understand why, especially if you’re an active adult looking for a place to stay in shape. There are two separate fitness centers, two 18-hole golf courses, 12 shuffleboard courts, as well as tennis, bocce, pickleball, and horseshoes. Residents enjoy a sandy volleyball court, a softball field, and a large outdoor pool. Some of the more unique activities include an archery club, hula dancing lessons, and water dancing. With 2,820 single-family homes within Plantation at Leesburg, active adults can find a large community of neighbors and residents who are just as interested in staying active and social. Resale homes are available in two- and three-bedroom models ranging in size from 1,872 square feet to 2,650 square feet. This community is half an hour from the airport and close to outlet malls and all of Orlando’s best theme parks. New and resale homes are available at Arlington Ridge, a 55+ community still being developed by several builders. Active adults can enjoy the 18-hole golf course designed by Gary Koch, or take practice swings on the driving range. For additional opportunities to stay active, residents can use the resort-style pool or the lap pool. 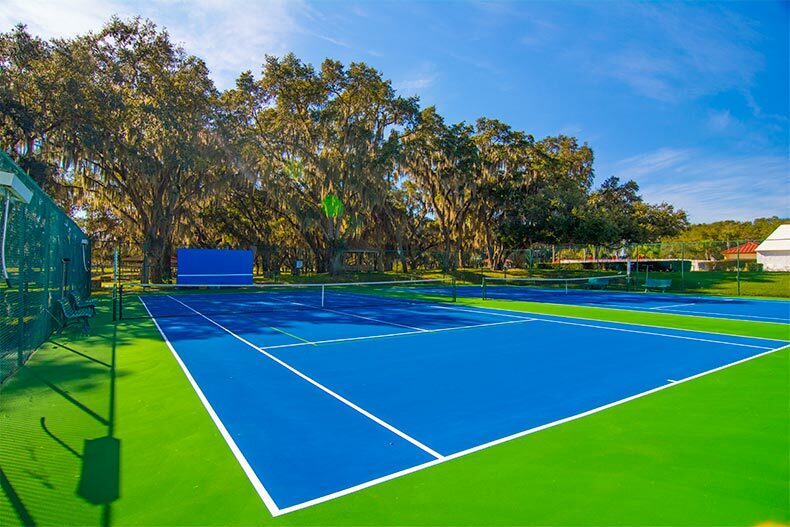 There’s a state-of-the-art fitness center and courts for tennis, bocce ball, and pickleball. An aerobics studio is available for a variety of exercise classes, and there are also trails all over the property, which are great for walking, jogging, and biking. With a handful of builders contributing to this community, buyers have a number of options when selecting a home. Whether two bedrooms or four bedrooms work best, there’s a floor plan and a price point for a large range of buyers. The community is secluded and surrounded by trees and lakes, but within a short drive to shops, restaurants, and recreation in and around Leesburg.